Stunning sea views and only a few minutes walk to Snells Beach, walkways and playground from this cabin. It is located in a cul de sac. Approx 10 minutes drive to Matakana, Omaha, Martins Bay and the many vineyards in this area. There is no hot water tap at the sink or at the basin - however the shower is an instant hot water system. Includes all cutlery, crockery, radio, TV, microwave, electric frying pan, electric jug, toaster, fridge/freezer, outdoor table, 4 chairs and umbrella. This accommodation is quite basic but it is clean and tidy and really suits those couples or families on a budget or who just enjoy the simple life! It is similar to staying in a cabin I guess, but you have your own facilities and it's cheaper. Any questions are welcome. We had a wonderful stay, with all that we needed. It was perfect for the kids and I, close to the beach and a playground. Beautiful views with a proper holiday feel. Hope to return next summer. Thank you Linda for your slice of paradise. So great, thank you so much for providing such a great place. Have stayed before and it is the ultimate for a fantastic price. The bach has all the basics and amazing views too. Contact with the owner prior was great and everything went to plan - Love a Minication in Snells. Exactly as described! Very good value for money! We were thinking about going to a Holiday Park but this was definitely better! We had all we needed for our stay! We'll come back! A perfect self-contained holiday cabin for a family and only minutes from the beach. 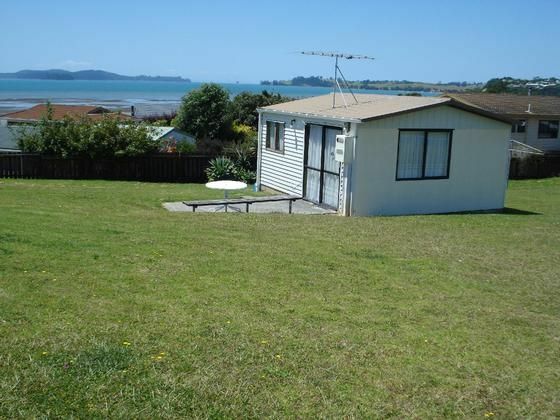 A perfect self-contained holiday cabin for a family and only minutes from the beach. Highly recommended as a destination. We loved our stay - clean, dry and cozy with a great shower.